Looking for a venue for a family event, meeting or group activity? If you are looking for a venue with character and more homely than a large hall, then look no further than Abdon Village Hall. 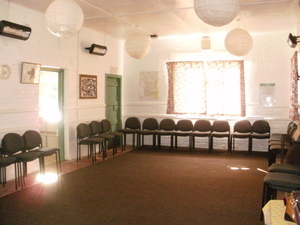 The Hall is suitable for smaller gatherings maximum number 60 people. It is the old Abdon School dating from 1850, but with modern facilities and disabled access. Set in a beautiful and peaceful rural location, close to Abdon Church, with plenty of parking and spectacular views of the Brown Clee Hill, it is an ideal location for day and evening activities all year round. Tables, chairs, crockery, cutlery and heating are provided. Please note that the kitchen has a hot water heater, but no cooker. We hold a coffee morning on the last Saturday every month from 10.30am to 12.30pm so do come along and check it out! Please note that the Village Hall is booked every Tuesday evening throughout the year for the Meditation Club. Use of the Village Hall kitchen, crockery, cutlery, furniture, electricity and heating are included in the Village Hall booking charge. These facilities are also available at no charge for church bookings and events. The Hirer is required to sign a copy of the Terms and Conditions when making a booking. These are attached.